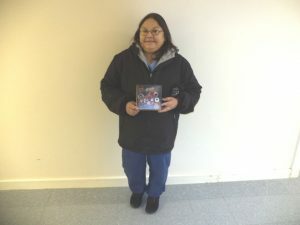 The WAHA Cancer Care Project team is proud to announce that Laura Sutherland of Moose Factory is the winner of the November – December 2012 colorectal cancer screening draw and has received a Kodak EasyShare Digital Camera for being screened. Laura’s name was selected from a group of people who participated in colorectal screening as part of the WAHA Under Never Screened Cancer Care Project. WAHA encourages men and women aged 50-74 to take part in colorectal screening by scheduling an appointment with a nurse or physician at a WAHA hospital or health centre (Moosonee, Moose Factory,Attawapiskat) or a Health Canada Nursing Station (Kashechewan and Peawanuck). Every person in this age group who participates in colorectal screening will receive a $25 Northern Gift Card (while quantities last) for being screened and will also be entered in a draw to win a monthly prize. For more details on the contest, please visit the following links. WAHA will be announcing the winner of the December 2012 – January 2013 shortly and encourages men and women who are 50-74 years of age to get involved by scheduling an appointment at your local WAHA or Health Canada location.